Unraveling Threads: Mongolia : " The Land of Felt"
I’ve shared some of the highlights of our fall trip: China and a bit of Russia. So now, we head to Mongolia. Mongolia, located between Russia and China, is a fascinating country with a most colorful history. 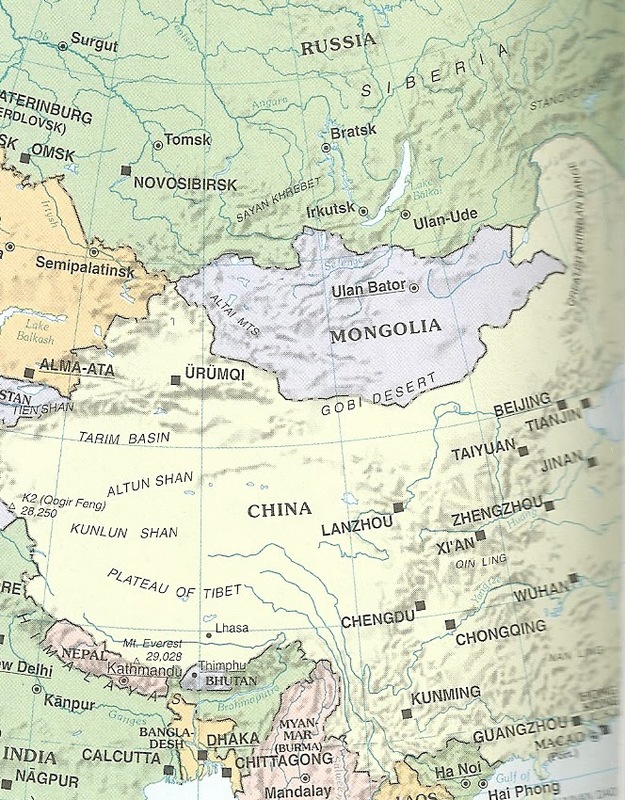 The Eurasian grassland , the Steepes, covers a region extending from northern China through Mongolia toward eastern Europe. Steepe dwellers were organized around clan and tribal units. The most famous of the Central Asian tribes were the Mongols. Until the end of the 12thC, the Mongols were a loose confederation of rival clans. In 1162BCE a young child was born, who by the age of 20 united the Mongol tribes, his empire reaching from China to the Caspian Sea. Much has been written about Ghengis Khan and he is honored everywhere in Mongolia today: Ghengis as a baby, Ghengis riding a buffalo, Ghengis seated in honor at the Parliament Building in Ulaan Baatar. 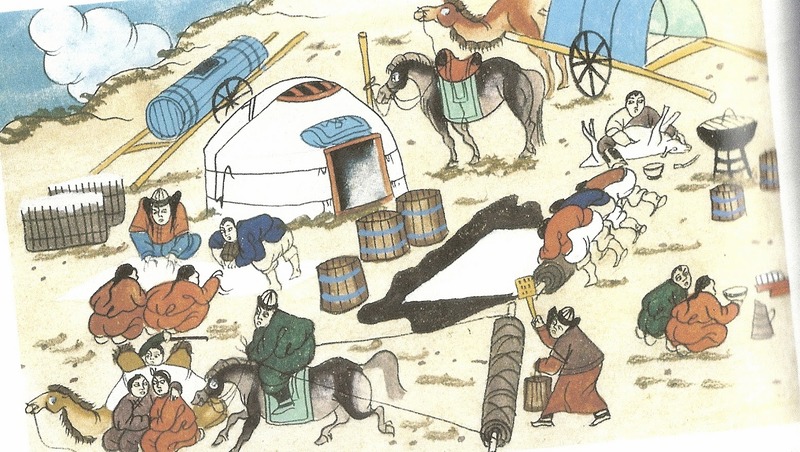 The nomadic pasturalists of Central Asia lived, according to the Chinese, in the “Land of Felt” as their world was dominated by a single fabric: woolen felt. Felting is a process in which masses of loose animal fur or hair form a firm fabric with the application of heat, moisture and pressure. The fibers are neither spun nor woven. This is possible due to the structure of animal hair, wool and fur. The fibers have a scaly surface which allow them to adhere to each other when manipulated. This is why keeping your sofa pet hair free is so difficult. The process used in the ancient times by the nomadic tribes has not changed significantly. In Genghis: Birth of an Empire, Conn Iggulden, Delacorte Press, 2007, pg 71-72, there is a description of felt-making .”The smallest children carried buckets full of water to sprinkle on each layer of woolen fleeces, keeping them constantly moist…boys tied the fleeces onto upright skins on frames and beat them with long, smooth sticks for hours…After the fleeces had been thrashed into softness, the women used the width of their outstretched arms to measure out one “ald” (old Mongolian measure, approximately 160 cm), marking the fleeces with chalk. When they had their width, they stretched them into felting cloths, smoothing and teasing the snags and loose fibers until they resembled a single, white mat. More water helped to weigh the rough felt down in layers, but there was real skill in finding the exact thickness…When the mats were smooth and regular ,a pony was backed up and the great expanse of white wool rolled into a long cylinder.” The pony then pulled the cylinder along the ground while the roll was beatened, further. It portrays the llet-making process described above. Felt was used in clothing along with animal pelts and, of course, in the construction of yurts (called “gers” in Mongolia) which were used as their primary shelters. Yurts are everywhere in Mongolia, even today, and I will present you with yurts in Mongolia: Part 2. Today felt is manufactured from man-made fibers which are stronger than natural fibers. A machine called a finishing range sets the width and the entire process is one-step which includes heat, pressure and chemicals. For the craftsman, woolen felt can be produced at or in the studio and there are many instructions available. However, haven’t we all created a Barbie sweater from mistakenly washing and drying a woolen sweater?